Harvesting your cannabis at the perfect time makes for the best bud hands down! The only problem is we can’t see the trichomes with our naked eye, so we need help to pick the perfect harvest time. That’s where the best magnifying glass for trichomes comes in. 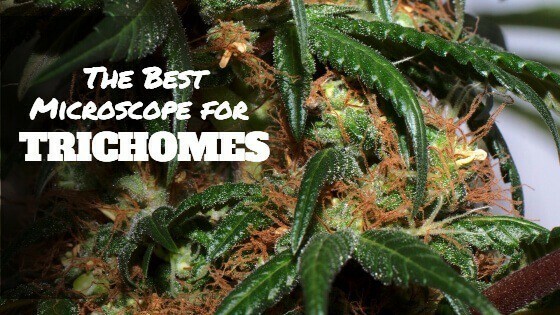 Today I’ll show you the best scope for trichomes, why you need one and how to use a microscope to pick your harvest time. The best and most fool-proof by far is by gauging the color of the trichomes. Trichomes are where all the magic happens in cannabis. These mushroom shaped crystalline structures, also called resin glands, are where the THC is produced. And these resin glands will let you know exactly when they are at their peak of THC productivity. Clear trichomes mean your plants aren’t ready. Once most of your trichomes are mostly cloudy, they are at their peak. Amber trichomes mean your plants are starting to develop a high CBN count which will give the marijuana a couch lock effect. You can harvest when your trichomes are anywhere from 2-60% amber. Any more than that and the THC degradation will start to take its toll on the cannabis. Some growers prefer the head high and harvest while the trichomes are cloudy, while others prefer the body high you get from amber trichomes. Either way, you need the best microscope for checking trichomes, or you’re not going to see anything. How you use a magnifying glass for marijuana depends on the type of scope you get. The most commonly used magnifying glass is the jewelers loupe. It’s a simple, and small, magnifying glass that is only about the size of your thumb. These typically zoom into about 60x which is plenty enough to see the color of the trichomes. The video below shows trichomes up close at about 300x—this can only be done using a digital microscope. Next, bring the loupe up close to the plant, making sure not to touch the plants. We don’t want to disturb the delicate trichomes! Bring your eye close to the magnifying glass and browse a few random areas on the cannabis plant. Is it possible? The short answer is maybe! You definitely won’t get as good of a view as you would if you were to pick up the best scope for trichomes, but you will be able to get a decent enough view to make a call on your harvest. You need a new phone to do this trick—one with a high-quality camera. You can take an up close picture with your phone, and then zoom in on the picture to get an up close look at the trichomes. What’s the Best Magnification for Checking Trichomes? You have a couple of different magnifying tools to help you check out your trichomes. Both have varying degrees of quality, features and zoom. Jewlers loupes are the beginning cannabis growers best friend. There’s not much to these little guys, but there are a couple of features that can really help. The first being that you want to see at least 40x, a lot of loupes will only go to 20x so keep that in mind. You also want an LED light to get a better picture of what’s going on. You can also opt to get a microscope, and there are a few advantages of doing just that. The biggest being is that pocket microscopes can see at up to 120x, and digital microscopes can see anywhere from 250-500x! Imagine how much more you’d learn with that kind of view of the trichomes. The biggest downside to going with a microscope over a loupe is the price. A quality digital scope can set you back quite a bit, while the cheaper pocket microscopes are usually crap. 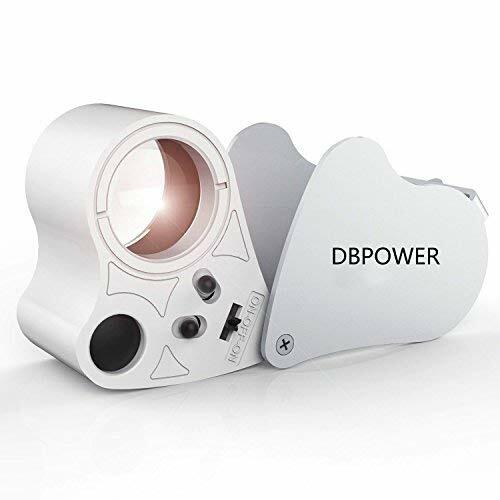 DBPOWER brings you the best loupe for trichomes. Its 60x zoom allows you to see your trichomes clearly and its lightweight design makes it easy to carry on you while you’re walking through your garden. Its bright LED light is easily switched on and bright enough to get a good look at your trichomes. The loupe is made with a high-quality optical glass and held nicely in a chrome plated encasing. The biggest knock on this loupe is the cost of replacement batteries. In fact, the price of batteries are so high that it makes more sense just to buy a whole new loupe when the batteries run out. Carson microscopes are an old favorite in the cannabis community. And if you prefer a microscope over a loupe, then you're in luck with this scope—it's the best microscope for view trichomes. This is their updated and upgraded model that should be a staple in any growers gardening tools. Being able to zoom from 60x-120x allows you to deep dive into your trichomes enabling you to choose the perfect time to harvest. 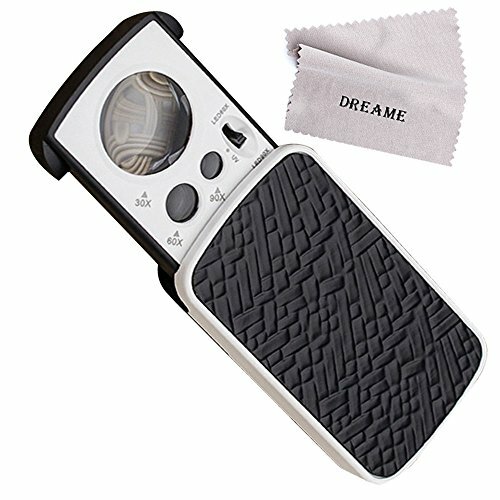 Plus, unlike most loupes that require crazy expensive batteries, this pocket microscope uses AA batteries! It has an aspherical lens that creates a sharper, clearer image. It has a very ergonomic grip that makes it very easy to hold steady which is huge when dealing with these tiny lenses. The downside with this microscope is that the focusing dial is right next to the lens so it can be a little awkward to focus. 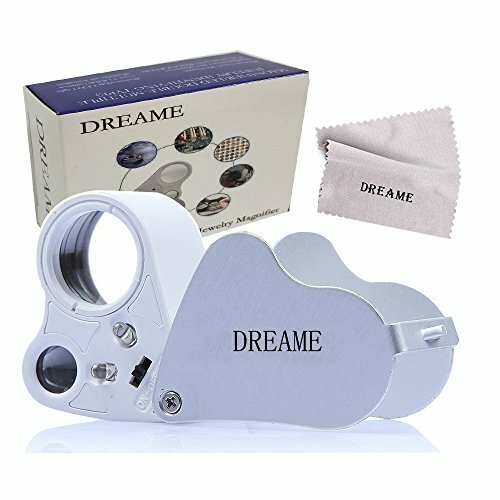 Another great loupe is the Dreame. It's a dual lens loupe that lets you see trichomes in either 30x or 60x. 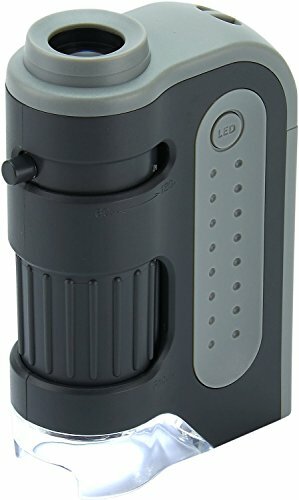 One of the cool features of this loupe is that it is a dual LED loupe, so both the 30x and 60x lens have their own light—both are easily switched on. You can easily fold it to cover its lenses, helping them last longer, and it fits nicely into your pocket. Again, the cost of replacing the batteries is a HUGE downside, but luckily you won’t exactly be burning through them quickly. You’ll only be using this for a few minutes at a time and only right before harvests, after all. This is a pretty neat loupe that features an outside the box design. It’s also stronger than most loupes—allowing you to see all the way up to 90x. The design allows you to pull the magnifying lenses out of the durable plastic housing in one of two slots. The first doesn’t turn on the LED lights while pulling it into the second slot does. I would like for the 90x lens to be bigger than it is. As it stands right now, you have to practically put your head in the cannabis plant to use it. It’s possible, but the 30x and 60x lenses are much more accessible. It also runs on expensive batteries! If you want to really see what’s going on in the tips of your trichomes, then you need a digital microscope. Hands down, you’re just not going to get a better view. Dino-lite offers a bunch of different models ranging from basic all the way to more advanced than the casual cannabis grower needs. If you elect to go with a digital microscope, you don’t need any more than the most basic. 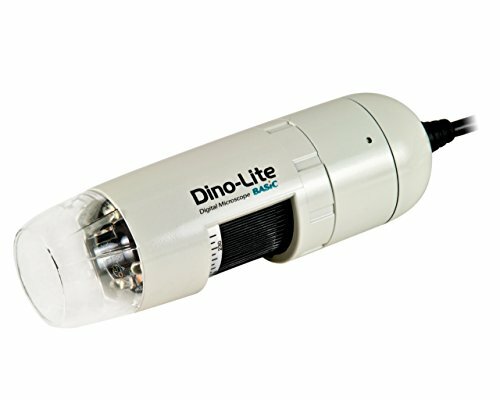 The Basic Dino-Lite has a 10-50x zoom and a 220x optical magnification. All of which is seen through a .3MP lens that can record at 30FPS. It also comes with software that can run on your desktop, Macbook, Android or iPhone. Though, if you are trying to use it with an iPhone, you’ll need to have a wireless adapter, and they can be pretty pricey! The digital microscope has a quick snapshot feature making it easy to take pictures to look hard for amber trichomes, and an adjustable polarizer that reduces glare. It also can quickly take pictures at multiple focus levels and combine them for a greater depth of field. I do wish that the basic model's resolution was better (640x480), but you can’t expect much from a .3MP camera. You can get all the way up to a 5.0MP (2592x1944) screen, but the price jumps way up there. You need the best magnifying glass for trichomes if you want the best harvest possible. 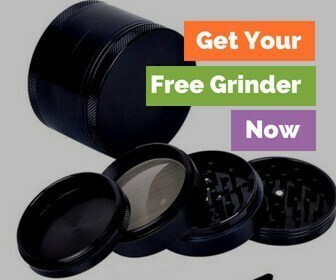 They are an indispensable tool for any grower and should be mastered during your first grow. Cutting your cannabis plants too early or too late will be detrimental to not only the amount of cannabis you grow but also the quality. Which are you going to go with? A loupe, pocket microscope or maybe even a digital microscope for trichomes? What’s your favorite marijuana microscope?